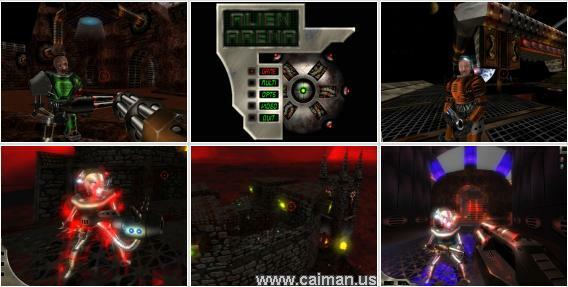 Caiman free games: Code Red - Alien Arena by COR entertainment. 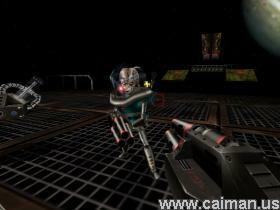 CodeRED is a standalone 3D first person shooter crafted from the original source code of Quake II. With features including 32 bit graphics, new particle engine and effects, hi resolution textures and skins, hi poly models, stain maps, CodeRED pushes the envelope of graphical beauty rivaling today's top games. 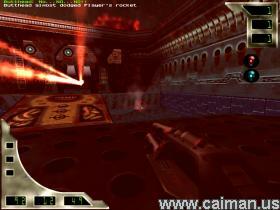 The game features a single player mode, including 14 levels, over a dozen powerful enemies, 10 weapons of mass destruction, and fast gameplay. With a campy sci-fi atmosphere inspired by such classic fare as War of the Worlds, 2001 Space Odyssey, and Mars Attacks, the player will take a nostalgic trip through a familiar world with the patented COR Entertainment vision and twisted imagery. Alien Arena features single play tournament style against bots. Of course what would a good sci-fi game be without some good old fashioned multi player options? Deathmatch, coop and teamplay are all supported, and highly encouraged. The player will also have a flashlight, which is always present, and very useful. Even the source code is included in the download. Please visit the authors homepage for more information. Features 25 levels, as well as five new mutators and 3 alt-fires, and major improvements to the engine. Authors DOWNLOAD page (install) 151,3 MB.